We've already got a good idea of what Windows 8.1 will bring to users when it lands later this year, but few new screenshot leaks have dropped a few more explicit details about the new look, most interestingly about changes to Xbox Music and the Windows Store. 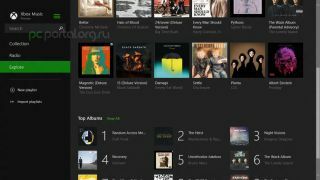 The new shots, first leaked by @BAV0 on Twitter, reveal the new user interface coming to Xbox Music, promising a much more streamlined experience. Microsoft recently spilled the beans on Windows 8.1 Find out what big changes are coming our way. First off, we can see a two panel interface is taking over, while the addition of a new "explore" button will also provide the ability to access music along the side navigation bar. It looks like the explore feature will work to help you find artists and albums that match your taste, while we're hoping that Microsoft's Smart DJ will be powering the radio, which is visible in the grabs. The leaked builds also show off the new Windows Store, which now sports a "shelf" feature that will provide more descriptions for applications when browsing. On top of this, the new design will give recommendations of other similar apps depending on what you're looking at. The more stuff we're seeing, the more that Windows 8.1 is looking much better than just a bog standard update - of course, that's assuming these leaks aren't just the Photoshop ramblings of someone with too much time on their hands.